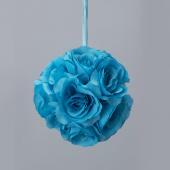 Our 4” turquoise rose silk pomander creates a splash of flowery color in your decor. This 4” kissing ball can sit or hang. Our 4” pomander ball is made with lots of turquoise silk roses.